One of the keys to designing old world style jewelry is to go big, go bold and go very ornate with large faceted or cabochon stones as illustrated by the 40/30 Czech glass pendant shown above. 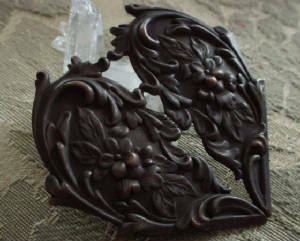 A oxidized brass lace filigree earring was folded over to create the large ornate bail. Layering (or stacking) various pieces of brass (variation of color adds dimension) and adding a large focal stone creates an ornate, high relief focal piece as illustrated in the men's neckpiece pictured below. ....and large ornate components give this men's neck piece an authentic period look. 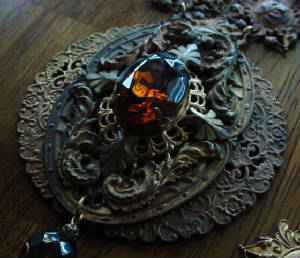 This piece features large Vintage 25x18 Czech glass Smoke Topaz rhinestones. This entire piece was made from vintage and old brass with natural patina. When designing, I like to lay out a bunch of pieces on my worktable so I can try different combinations. It's a bit like putting together a puzzel...just keep trying different pieces until they "fit". Get yourself a nice assorment of brass pieces in various colors and just go for it! These large ornate pieces make great conversation pieces and wall art and hey, you never know when you might want to go to the renaissance festival. 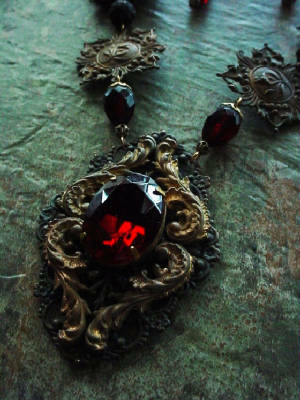 This large oxidized brass gothic heart makes a great focal piece for a gothic neck piece. 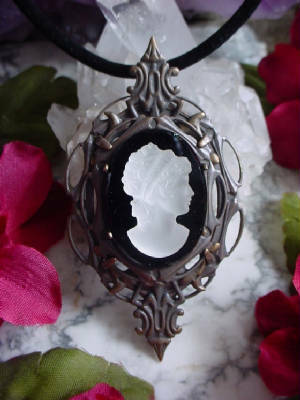 It can also be embellished with stones, chain and/or ??? 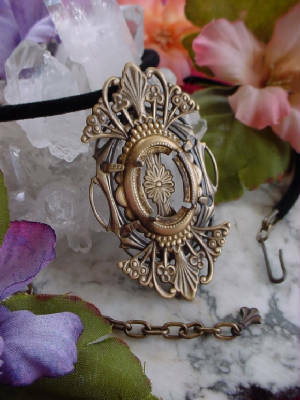 The Victorians took on many of the design elements of the gothic and renaissance periods as illustrated by this layered brass filigree setting which has a Gothic style. This setting was created by using a 30/22mm pronged setting as the back piece. A bow shaped Art Nouveau filigree was placed lengthwise in the setting, then a 18/13mm Art Deco setting was placed over that. While holding everything steady, the prongs of the 30/22 setting are pushed over to hold the 18/13 setting in place which in turn holds the entire setting together...no glue or wire needed. This setting was made with oxidized brass components then buffed with xfine (#000) steel wool to expose brass highlights.. 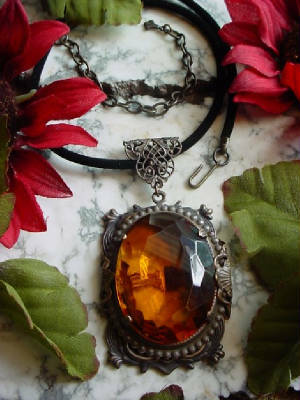 When designing Gothic and Renaissance Style jewelry I prefer to use vintage Czech or German glass rhinestones rather than Swarovski Crystal to tone down the design giving it a medieval, old world look. That being said, I do use Swarovski Crystal and/or Czech/German cabochons as they are not faceted and add nicely to old world designs. 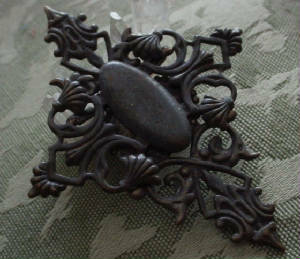 My dark oxidized brass pieces are perfect for gothic work as illustrated in the pendant above. Get stunning results by layering (or stacking) various brass components and mixing different colors of brass to create a focal piece of distinction. 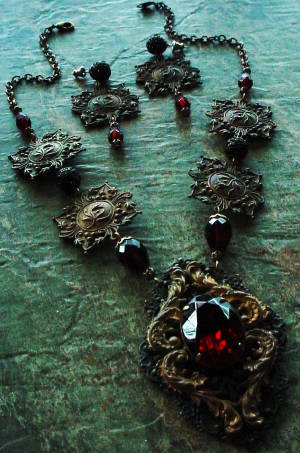 In this gothic style set, I used serveral different colors of brass adding seperation to the design. Vintage Czech Glass Siam Ruby Rhinestones and beads are my pick for achieving an "old world" look. Imperfections in the beads and/or stones are welcome as they really do add the the authentic medieval look. In this set I combined old natural patina brass with our hand oxidized brass (left with its dark patina) to create added drama and dimension. 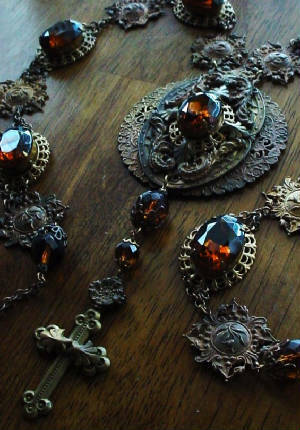 There are no rules in designing these large ornate pieces...and that's what makes them so fun to make. The bigger, the bolder, the better! This DIY large gothic cross is actually 2 pieces glued together with E6000 glue. It has a nice center pad for adding a large stone.